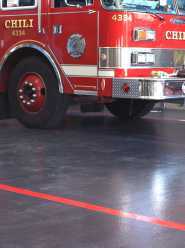 Fire Houses and Ambulance garage floors take a daily pounding from surface abrasion and road salt causing premature deterioration of concrete floor surfaces. This is why more and more knowledgeable fire house and ambulance operators choose to install a protective epoxy floor coating. Not only is it visualy more attractive than a concrete surface and much easier to clean and maintain, the tough industrial grade expoxy coating will protect the concrete floor surface from damaging chemicals and salt erosion for many years to come. 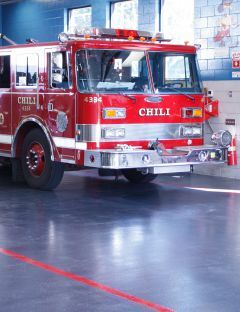 Some fire houses have chosen to proudly dispay their fire company emblems on the fire house floor. While installing a new Epoxy floor, MARTENS can embedd a specific grahic, your fire company emblem or your logo into the epoxy floor. The graphic is made of special materials that allows it to be directly impregnated into the epoxy coating. It is then covered with a final clear epoxy coating, protecting it from wear and tear. Fire Company logo imbedded in epoxy floor is protected with a clear coat of epoxy. Martens can create a design or use any existing design provided by client. 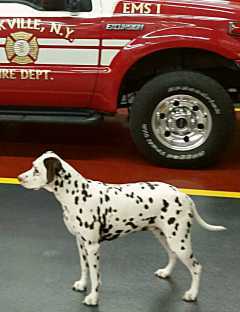 If your fire house floors are pitted and cracked, you need not consider major concrete repairs or replacing the floor. Martens will fill all pits, cracks and voids with a very stong and durable expoxy cementitious composite to provide a very stable and smooth base for the protective epoxy coating. 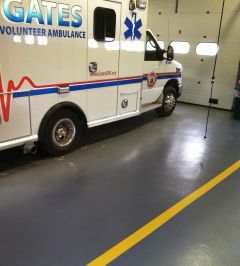 If you are considering an epoxy floor for your fire house, ambulance garage or aircraft hanger, Martens is your best choice. With more than 28 years in the commercial and residential epoxy floor business, we are Western New York's epoxy floor experts. And because we have worked on large fire house floor areas, you can count on Martens to deliver the best quality and most durable epoxy floor your money can buy.